Well, I get to go back to work today, for just one day. After today, however, I'm going to have a couple of 40 hour work weeks. That's okay. The rain has finally stopped.... until tomorrow, my day off. Looking at the long range forecast, or at least the 2 weeks Accuweather provides, this pattern is not going to change. High humidity and thunderstorms are to be expected. Zounds!! What a stinky summer this is turning out to be. I did free weights yesterday, upper body, so I'm a tad sore. That's fine. There's absolutely nothing wrong with working your muscles. My mom once told me that if you're the slightest bit sore you did too much. She was quite adverse to both exercise and perspiration. Her idea of a workout was very easy repetition - a workout without the work. I went to see her yesterday. She was sitting in her chair wearing her night gown. It was around 1:30 in the afternoon. She told me she was packing to go home. She is very confused. She still recognizes me, my brother, and my sister, but at some point that will fade as well. This is dementia. My sister is finding it emotionally stressful. My brother is digging into his religious denial chest and pulling out who knows what. He visits her and they pray, as if that's going to change anything. Me? I think we should have left her die 3 years ago, when she was having heart attacks daily. Of course, we listened to her doctors. That's what you do in situations like that. The sad truth is that the longer they manage to keep her alive, the more money they make. They could really care less about the quality of her life. And the Idiot Jerk's Blow Buddy Vlad gave me a soccer ball with a transmitter chip. The balls are made that way. The chip works with your cell phone. You could sort of think of it as a talking, listening ball, sort of like a 'smart ball.' Funny, you know? Putin giving the Idiot Jerk smart balls? While I was scanning news articles yesterday, I chanced upon an interesting tidbit. 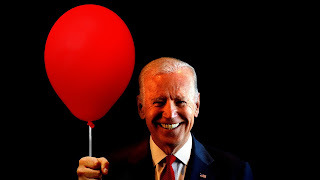 Evidently the Idiot Jerk in the White House is frightened of Joe Biden. You see, the Idiot Jerk knows that Joe, even as old as he is, can dribble circles around him on the basketball court. While Joe goes in for an easy lay-up, the Idiot Jerk is going to be screaming "why do I always have dumb balls! Why don't I ever get any smart balls?!" I guess no one ever took the time to tell him that not one of us has smart balls. Sorry about your mom. That's a hard situation or all, and everyone handles it differently. The whole situation is surreal. Does he even have any balls?????? Well... he must cup his tiny little hands around something. Your mother's illness must be very difficult to deal with. I am lucky that my mother is still doing well. Joe Biden has all of the class that Trump doesn't. It more odd than anything else. And if Joe were only younger. Still, there's no reason he can't run around handing out red balloons to Republicans.